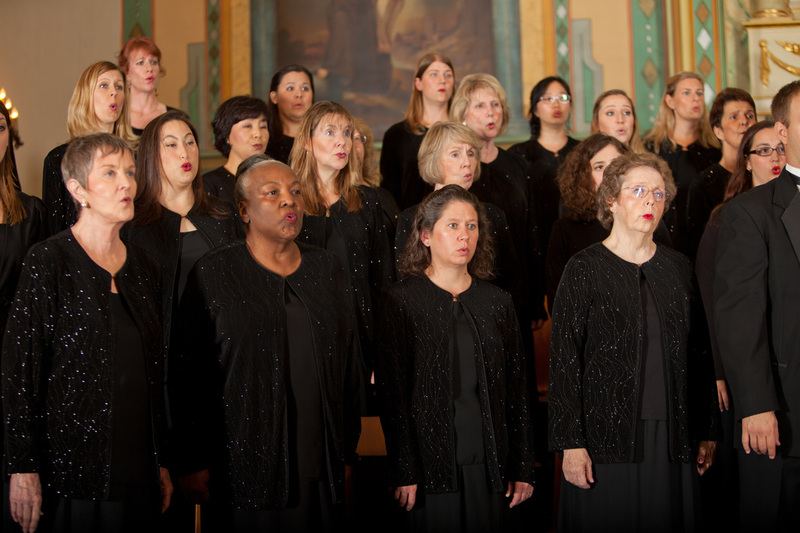 Since 1962, the Santa Clara Chorale has provided singers and audiences alike the opportunity to experience great choral music. Members and audiences have been introduced to the classical choral music of Beethoven and Mozart, the challenging contemporary music of Eric Whitacre and Libby Larsen, and the diversity of traditions in jazz, spirituals, gospel, Broadway, popular music, and world music. Whether connected locally or internationally, the Chorale continues to share the joy of choral music wherever it goes. Local collaborations have included performing with jazz greats like David Brubeck and Vince Guaraldi, the Boston Pops Esplanade Orchestra, and regular orchestral collaborations with the Jubilate Orchestra, the San Jose Chamber Orchestra, and Symphony Silicon Valley. The Chorale also enjoys a rich history of touring internationally, from performing under the baton of Sir David Willcocks at Coventry Cathedral in England to presenting concerts in some of the worlds great venues in Israel, Poland, the Russia, Austria, Italy, and Argentina. For the hundreds of singers who have participated in the performance of great choral music and for the thousands who have heard the Santa Clara Chorale's sound in concert in the beautiful Santa Clara Mission and abroad, there is no question about the human appetite for the inspiration of the spirit provided by the performance of great music. Singers and audiences know the electricity of those moments when voices and listeners connect and the music is brought to life. Dr. Scot Hanna-Weir leads the Santa Clara Chorale as their artistic director and is also director of choral activities at Santa Clara University where he oversees the choral program, directs the SCU Chamber Singers and Concert Choir, and teachers other courses within the music department. Dr. Hanna-Weir received his DMA from the University of Maryland - College Park (UMD) where he studied under Dr. Edward Maclary. At UMD, Dr. Hanna-Weir prepared the University Chorale for performances of Mendelssohn's Elias with the National Symphony Orchestra under Helmuth Rilling, and conducted Dominick Argento's I hate and I love as part of The Art of Argento festival with the composer in attendance. He conducted the UMD Chamber Singers and UMD Wind Orchestra in a performance of the Stravinsky Mass, the UMD Concert Choir and UMD Symphony Orchestra in Ives’ General William Booth Enters into Heaven, and the UMD Summer Chorus in Haydn’s Harmoniemesse. Dr. Hanna-Weir has also prepared choruses for the National Orchestral Institute under Asher Fisch, the Maryland Opera Studio, and served as director of the UMD Women’s Chorus. In addition to his work at UMD, Dr. Hanna-Weir has significant interest and experience in new music and music from non-western traditions. As director of the All Souls Choir at All Souls Church, Unitarian in Washington, DC, he commissioned and premiered a new choral orchestral work by award-winning composer Scott Gendel, collaborated regularly with outside artists from diverse musical traditions, and led the choir in a variety of musical genres. Before moving to Washington, Dr. Hanna-Weir directed the vocal music program at Tecumseh High School, where he led his choirs to consistent success at district and state choral festivals. Dr. Hanna-Weir has appeared regularly as a music director for theatrical productions and as a clinician and adjudicator for choral festivals. In addition to his DMA, he holds a BM in Music Education from the University of North Carolina at Greensboro and a MM in Choral Conducting from the University of Wisconsin at Madison. Dan is a versatile musician who has performed professionally as a countertenor soloist, choral singer, and accompanist. Originally from southern California, he studied piano and voice at Biola University. He received his Master's degree in accompanying at East Carolina University, where he made his countertenor solo debut with Capella Antiqua. After working three years at Biola as Staff Accompanist, he joined Chanticleer for their 2005-06 season, singing concerts across Europe, Japan, and the United States. Dan continues to perform throughout the San Francisco Bay area both as accompanist and singer. He has played for Santa Clara University, West Bay Opera, Livermore Valley Opera, BASOTI, Santa Clara Chorale, Lamplighters Music Theatre, and has worked as a freelance accompanist and coach. As a singer he has performed with various ensembles, including American Bach Soloists, Philharmonia Baroque Chorale, Clerestory, Pacific Collegium, Sanford Dole Ensemble, San Francisco Renaissance Voices, and Grace Cathedral Choir of Men & Boys. ​As a soloist Dan has performed Handel's Israel in Egypt and Vivaldi's Gloria with the Santa Clara Chorale, Monteverdi's Vespers of 1610 with Bach Collegium San Diego, Handel's Te Deum in A Major with San Francisco Lyric Chorus, Bach's Johannes-Passion with Bay Area Classical Harmonies (BACH), new editions of Alessandro Scarlatti's works with Arcadiana, and early music recitals on SCU's Faculty Recital Series and at St. Dominic's Catholic Church. When not onstage or behind a piano, Dan can usually be found either on a hike in the mountains or at home baking gourmet goodies.